After nearly 2 years of constant interviewing, mailing and emailing resumes, endless applications and phone calls…..I’ve finally been hired! I’ve had visions over the last months of a new office, whether billing medical claims, adjusting the budget for a large company, selling legal services…whichever position I landed in, I thought a new wardrobe would be in order. New clothes that fit the timbre of the office I’m joining…and I guess in one manner of speaking, I was right. Well, you guessed it. I’m your friendly neighborhood “mail carrier”. Until I get my “light blue’s”, I’m wearing my own jeans, warm boots, long johns and fingerless gloves. I’m delivering the mail!! I wasn’t sure about this, I knew I could DO the sorting, understand the method, etc. I just didn’t know if I could handle the workload physically. I was afraid I’d be freezing all day every day, miserable and confused. After more than 30 days on the job I can tell you I’ve NEVER been cold at work! 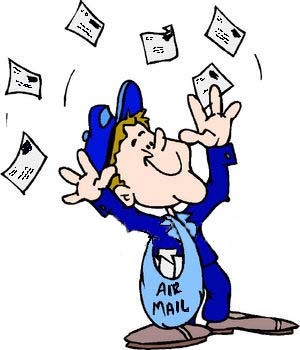 I stay too busy hopping in and out of the mail truck, running packages to the door or the mail to the front porch mailbox of a disabled or elderly person. I can testify that the LLV’s, or “light load vehicles” maintained for the letter carriers have the best heaters you’ve ever experienced. Even with the window down all day as I spurt from mailbox to mailbox, I’m as warm as toast. I discovered that this job is for all the kids who loved ringing doorbells and running away in their childhoods. That’s what I do all day–lope from the truck to the front door, deposit the package, ring the door bell, and run back for my next delivery. Gives you a kind of perverse pleasure somehow. And my next surprise has been the kindness of my coworkers. Our little town has countless rural carriers, 10 city carriers and 2 of us “subs” who step in when there’s an illness or a day off for one of the crew. Nearly every one of them has stepped up and offered me a tip, stopped during their busy routine to show me how to find the right place for those “forwards,” “attempted not knowns,” etc. Why, one even brought me some freshly butchered pork chops from his own private stock! (recipe to follow after I’ve tried them). You won’t believe all that I’ve learned in such a short time. 1. Always turn right. Well, nearly always. The routes wind through the neighborhood, often looping back down the other side of the same street–and then turn right. Or go an extra block–and turn right. Or skip two blocks, do a u-turn, and then–you get the picture. But right’s the rule. 2. When you notice an errant piece of mail slipped behind the others and it belongs 2 houses back, just let it go. Don’t go back. NEVER, I mean NEVER back up!! But above all, be sure you deliver every piece of mail. it’s just not done, to bring mail back to the post office. Confused? Welcome to the post office! 3. Follow the mail. The main post office sends out little trays of presorted mail, already set in the order it should follow to complete the route. I thought it was wrong. It skipped numbers, sometimes it went backwards for a few numbers, and it changed streets without warning. But I eventually learned that no matter what, if I kept going to the next house in the mail list, the route would lead me right to the end and back to the post office. Well, nearly. I’m very impressed with the minds who put this system together. I just wonder how they knew to take into account the mail that goes through the slot in the garage door; the “official” blue plastic trash can (yes, someone uses one, for a different type of mail receptable) and the path behind the car wash. Or how the numbers flip flop in our little town so that 303 comes before 301, and 405 comes right after 411–sometimes. 4. Be sure to scan every package. They have a fancy new tracking thing now that helps the sender and the recipient follow that surprise birthday CD from its origin to the front door of little Susie on her birthday as promised. So scan, scan, scan! ‘Cause it doesn’t work if you don’t. Scan. 4. Dogs. Can’t kill ’em. Can’t pamper them. I’ve been advised to carry dog treats, to befriend the little guys. To carry dog “repellant” to protect myself. To ignore them, to avoid eye contact, and just about every other old postman’s tale out there. Funny, I’ve never had a problem with dogs. I just talk to them when I’m near their yard, and keep in mind I’m invading their territory. It makes sense to me that they should bark to alert their owners of strangers, that’s their job. Don’t you agree? Only once so far did I feel threatened, slightly. A glossy black rottweiler came lunging at the fence, hoping it would give under the pressure of his broad chest so he could lift my lungs out of my chest. I put my mail and packages in the mailbox (just outside of his reach), glanced his way and warned him, “Hey, big guy, back off. I know a chihuahua who could EAT YOUR LUNCH! There’s a whole lot more. I’m learning new things every day. Too much to share tonight. But I wanted to sound off. I’m so proud. Not of me. Or of the work I’m doing.